There is nothing like college football. It is now August, so fall camps have started and the season is actually in sight. 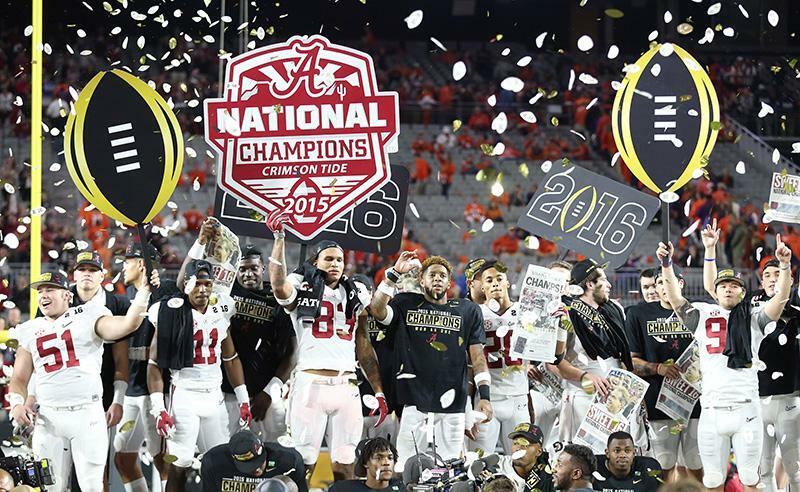 Alabama is coming off another National Championship, but they need to rebuild all over their team. This might be one of the difficult seasons to prognosticate we have seen in the last decade. I can’t wait for the season to start. Read up on my favorite article to write every year! 7. Boston College Eagles (HC: Steve Addazio, 4th season) – They had the top defense in the country in some meaningful statistics, but they still weren’t in a lot of games because their offense was so awful. A new coordinator could help that, but I still fear they are finishing at the bottom of the ACC. 6. Wake Forest Demon Decons (HC: Dave Clawson, 3rd season) – It seems like an eternity since the last time Wake Forest was relevant in the Atlantic Division. They were a notably young team last season, so depending on how those players developed in the offseason, we could be looking at a much improved season under Dave Clawson. 5. Syracuse Orangemen (HC: Dino Babers, 1st season) – The issue that Cuse is going to face is on the defensive side of the ball. Baber’s high powered offense coming from Bowling Green should excite the faithful, but they are going to have to outscore opponents and at least pull one decent upset to make it to a bowl game. 4. Louisville Cardinals (HC: Bobby Petrino, 7th season) – The Cardinals have a bunch of hype coming into 2016. Lamar Jackson appears to be the QB who can take them to the next level, but their schedule is rough by ACC standards. 3. North Carolina State Wolfpack (HC: Dave Doeren, 4th season) – The Wolfpack were formidable last season, but they have to replace key pieces on offense, including QB and O-line, but their defense should keep them in most games. 2. Clemson Tigers (HC: Dabo Swinney, 9th season) – Clemson seems to be everyone’s pick to win the National Championship just because of their returning star QB DeShaun Watson, but the reason why they were so great last year was defense. They lost a truckload of players to the NFL from that side of the ball and will struggle in the trenches, particularly against the eventual division champion FSU. 1. Florida State Seminoles (HC: Jimbo Fisher, 7th season) – With Dalvin Cook returning from a team that really exceeded expectations last year, the Seminoles should return to the ACC Championship Game after just a one year absence. They are going to be loaded once again. 7. Virginia Cavaliers (HC: Bronco Mendenhall, 1st season) – The Cavaliers were awful a year ago, but there is some optimism with Mendenhall leaving the job we all expected him to be at his entire career, his alma mater BYU. They will likely be more sophisticated on offense, but that won’t translate into too many wins in year one. 6. Duke Blue Devils (HC: David Cutcliffe, 9th season) – With starting QB Thomas Sirk coming off a February Achilles terror, the offense has a lot of question marks heading into 2016. Throw in a new look coaching staff under the great David Cutcliffe, and we might be looking at the first bowl-less Duke team in five years. 5. Virginia Tech Hokies (HC: Justin Fuente, 1st season) – Fuente was an interesting hire for VT, looking to replace Frank Beamer after 29 seasons. He was a sudden star at Memphis, but how much of that was Fuente and how much was Paxton Lynch? That remains to be seen, but the Hokies have enough returning talent to still keep their impressive bowl streak alive. 4. Georgia Tech Yellow Jackets (HC: Paul Johnson, 9th season) – Aside from the shocking, amazing last second upset of Florida State a season ago, GT was the biggest disappointment in the nation. Their offensive line was atrocious, making talented triple option QB Justin Thomas look pedestrian at best. They need to fix the line, and if they do, then they could return to the ACC Championship Game in a weak Coastal Division. 3. Miami Hurricanes (HC: Mark Richt, 1st season) – Yes, Brad Kaaya is the real deal, but Richt could never win the big game at Georgia with NFL talent at all levels. Miami has developed a culture of disappointment over the past decade, and I am just not sure if Richt will change that too quickly. 2. North Carolina Tar Heels (HC: Larry Fedora, 5th season) – They had a shocking run to the ACC title game a year ago, and with a lot of their players coming back (excluding game-breaking QB Marquise Williams), the Tar Heels should have another strong season led by Gene Chizek’s improved defense. 1. Pittsburgh Panthers (HC: Pat Narduzzi, 2nd season) – Narduzzi’s team will be heavily run-based and defensive-minded. 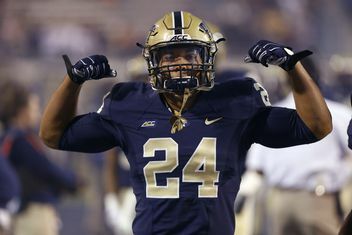 Putting them in the ACC Championship Game is mostly assuming that former star RB James Conner, fresh off MCL surgery and chemotherapy, will return to form as one of the top backs in the nation. Either way, having an inspiration like him on the squad could elevate the lesser talent on the team to being as good as anyone in the Coastal Division. 10. Kansas Jayhawks (HC: Dave Beaty, 2nd season) – Things aren’t exactly looking up for the Jayhawks, who finished last season 0-12 with tons of injuries and a loss to an FCS team. Beaty’s leash should be pretty long, given the fact that they are expected to be horrible and no one really cares about football in Lawrence. I expect modest improvement, but an FBS win is a lot to ask for. 9. Iowa State Cyclones (HC: Matt Campbell, 1st season) – This team will be much improved under former Toledo coach Matt Campbell. He already changed the game in recruiting to Ames, and he has some offensive talent returning. It will take a couple years to establish himself in the Big 12 hierarchy, but the Cyclones will be capable of pulling an upset or two in 2016. 8. Texas Tech Red Raiders (HC: Kliff Kingsbury, 4th season) – The season will rest on the shoulders of the great Patrick Mahomes once again. The talent around him is not as strong as a season ago, but he is good enough to keep them in many games and outscore teams on a weekly basis. Their defense is going to be putrid, however. 7. Texas Longhorns (HC: Charlie Strong, 3rd season) – Texas is going to have an uphill climb to get back into the mix in the Big 12. They are likely going with a true freshman QB to start, which will hurt when playing a brutal stretch in September and early October. 6. West Virginia Mountaineers (HC: Dana Holgorson, 6th season) – Skyler Howard is a great option at QB in that high powered offense, but the hard-hitting defense of 2015 has to be rebuilt. This will likely look a lot more like the first couple years of Holgorson’s tenure than last year’s optimistic return to form. 5. Kansas State Wildcats (HC: Bill Snyder, 25th season) – We will know a lot about Snyder’s club in week one when the Wildcats travel to Palo Alto to play Stanford. Last year was mired in injuries, particularly at quarterback. Their defense should be among the best in the Big 12, which will cover a lot of the deficiencies on offense. 4. Baylor Bears (HC: Jim Grobe, 1st season) – It is difficult to predict what will happen to Baylor after everything that happened off the field. They still have a ton of talent offensively, and they keep their longtime defensive coordinator Phil Bennett in place. They should have some continuity, but losing recruits and transfers does not help. 3. Oklahoma State Cowboys (HC: Mike Gundy, 12th season) – There are nine returning starters on offense, including Mason Rudolph, arguably the most talented QB Gundy has had at OSU. They have the other top three teams in the Big 12 on the road, the opposite of last year when the conference’s final month all went through Stillwater. 2. Texas Christian Horned Frogs (HC: Gary Patterson, 17th season) – TCU’s bowl game against Oregon had to leave a good taste in the mouth of Frogs fans. Without star QB Trevone Boykin, they overcame a 31-0 deficit to win. The Frogs must be optimistic with their returning players from injury and an exciting transfer in Kenny “Trill” Hill from Texas A&M. 1. Oklahoma Sooners (HC: Bob Stoops, 18th season) – Baker Mayfield and Samaje Perine should be able to single-handedly win the Big 12 for the Sooners. However, what may keep them out of the CFP discussion could be the turnover on defense. They have a lot of holes to fill, but we will see how that has progressed when they host Ohio State in late September. 7. Rutgers Scarlett Knights (HC: Chris Ash, 1st season) – Chris Ash is an inspired hire for Rutgers, an athletic program that has been under scrutiny over the past half decade. Ash is an exciting young coach who can eventually get them back to where Greg Schiano had them. They do, however, have one of the toughest schedules of any team. It is a rebuilding process, but it might not take as long as some think. 6. Indiana Hoosiers (HC: Kevin Wilson, 6th season) – It is going to be difficult for the Hoosiers to get back to a bowl game in 2016. They lost almost all of their offensive production, and their defense has been notably pathetic under Kevin Wilson. They will likely reload at running back, but I just can’t see them being as tough of a squad as in the previous couple seasons. 5. Maryland Terrapins (HC: DJ Durkin, 1st season) – The team is not exactly loaded with talent, but building around defense will make them an interesting team in the division. With the running game in good shape, they should be able to control the clock and spring an upset or two in year one for Durkin. 4. Michigan State Spartans (HC: Mark Dantonio, 10th season) – The offense has big shoes to fill with the departure of Connor Cook, but the defense will be stout and deep. I fear that the team will struggle to score, as they did when Cook was injured for part of last season. They will take a slight step back in 2016. 3. Penn State Nittany Lions (HC: James Franklin, 3rd season) – There will be a new look spread offense in Happy Valley. Saquon Barkley comes back as one of the Big Ten’s best running backs. The QB situation will be settled soon, and the team will be the best that Franklin has had. 2. Ohio State Buckeyes (HC: Urban Meyer, 5th season) – We will know a lot about the 16 new starters for Ohio State when they travel to Norman in week three. JT Barrett will cover a lot of the deficiencies and be a calming influence under center. All of the top recruits will eventually get the Buckeyes back to being one of the best in the nation, but it might take a little while. The Game will decide this division either way. 1. Michigan Wolverines (HC: Jim Harbaugh, 2nd season) – Michigan is breaking in a new quarterback, but they have some of the best receiving options in the conference. They return almost their entire frightening defense. They also have a cakewalk schedule. If they lose more than two games in 2016, then I would have to mark them as one of the biggest disappointments in the nation. 7. Purdue Boilermakers (HC: Darrell Hazell, 4th season) – How exactly does Hazell still have a job? They just won their first home Big Ten game in Hazell’s third season. They were one of the worst teams offensively and defensively in the nation, but they return almost all of their starters! We will find out how much upper classmen actually matter in a rugged conference. 6. Minnesota Golden Gophers (HC: Tracy Claeys, 1st season) – Claeys was a logical continuation coaching choice for Minnesota. With returning starting QB Mitch Leidner, the offense will be in good hands. The defense recruited well to replace some holes, but this division is so stocked in the middle that it will be difficult to finish above here with by drawing Michigan and Ohio State from the East. 5. Northwestern Wildcats (HC: Pat Fitzgerald, 11th season) – They had a strange season in 2015, finishing with 10 wins, but getting absolutely blown out in their two losses. They return Justin Jackson and Clayton Thorson, which is good, but the offense was inept most of the season anyway. Those close, defense-driven wins will likely go the other way this season. 4. Wisconsin Badgers (HC: Paul Chryst, 2nd season) – The Badgers return injured RB Corey Clement, which will help stabilize a team that has a lot of turnover. They also lost longtime D Coordinator Dave Aranda and steady QB Joel Stave. The offense will need to take a step forward if they want to compete in this division. They were a forgettable and irrelevant squad in 2015. 3. Illinois Fighting Illini (HC: Lovie Smith, 1st season) – It is going to be interesting to see how Lovie Smith adapts to the college game. He is a strong personality and will likely be able to inspire players. Wes Lunt returns for a third season as QB, which will help the offense that struggled for some part of 2015. This is one of the overlooked teams and coaching hires in the country. I can see them springing some early upsets and getting to 8 wins. 2. Iowa Hawkeyes (HC: Kirk Ferentz, 18th season) – Starting quarterback CJ Beathard returns once again, who has been one of the most consistent signal callers in the nation over the past season and a half. They will be a tough out again, but their schedule is not as pathetic as last year. 1. 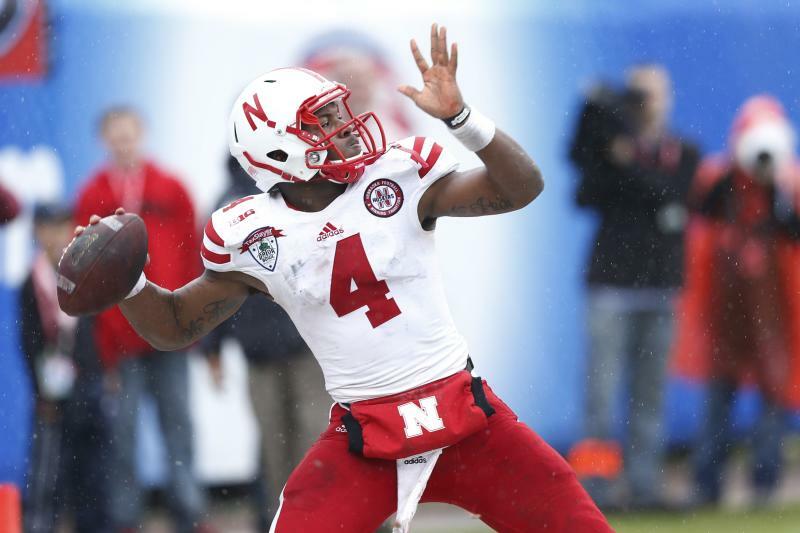 Nebraska Cornhuskers (HC: Mike Riley, 2nd season) – The returning starters, including Tommy Armstrong under center, are going to be the key for Nebraska to get to the Big Ten title game. 2015 was defined by close losses for the Huskers, and those tend to return to the mean over time. They have some difficult matchups, but this division will come down to the season ending game against Iowa. 7. Vanderbilt Commodores (HC: Derek Mason, 3rd season) – There was improvement in 2015, but they still are at the bottom of the pack. They might be able to hold on against a few high quality SEC opponents like usual, but a bowl game is a lot to ask. 6. South Carolina Gamecocks (HC: Will Muschamp, 1st season) – Once again, Muschamp fails up. However, he knows that it is a complete rebuild and they will be awful for 2016. Look for the defense to keep them alive, but they won’t be winning many conference games. 5. Kentucky Wildcats (HC: Mark Stoops, 4th season) – This is one of those programs that seems to look the part, but their confusing losses still haunt them. They got a host of transfers that will help them immediately, but their offense will struggle the majority of the season. 4. Missouri Tigers (HC: Barry Odom, 1st season) – The Tigers could quietly have a really nice season under a new head coach and offensive coordinator (Josh Heupel). They have a returning starter at quarterback, and the defense played reasonably well last season. They cannot contend in the division, but they can make some noise since they are constantly under the radar. 3. Georgia Bulldogs (HC: Kirby Smart, 1st season) – Smart finally is getting his chance to being a head coach, and he inherits quite the roster to start out. He returns arguably the two best running backs in the SEC in Sony Michel and Nick Chubb. His defense returns a host of All-Conference level starters. We will see how the quarterback situation develops, but look for good things in year one for Smart. 2. Tennessee Volunteers (HC: Butch Jones, 4th season) – Every year, Tennessee is anointed as being “back”. Every year, they fail to win the big one. They return a ton of starters, but this division is not as bad as it seems. They will likely be a really good team and win 10 games, but they are going to finish behind a better coached team. 1. Florida Gators (HC: Jim McElwain, 2nd season) – They were the surprise SEC East champion last year. This year, they cannot really get much worse on offense, but their defense is still going to be difficult to move the ball on. I say they win in Knoxville and take the division with 10 wins. 7. Texas A&M Aggies (HC: Kevin Sumlin, 5th season) – The Aggies had some players transfer and decommit after immaturity in the coaching staff. That cannot bode well for Sumlin, who is looking to get his team back in contention in the division. They did get Trevor Knight from Oklahoma, and Myles Garrett is the best defensive end in the nation, but that isn’t enough to cover all of the holes on this roster. 6. Auburn Tigers (HC: Gus Malzahn, 4th season) – Malzahn’s genius took a hit last year when he couldn’t figure out the quarterback position. Everyone is writing them off, but that is what happened before they went on an SEC Championship in 2013. They will have a much improved defense, but they just aren’t going to be able to move the ball as well as we have become accustomed to. 5. Mississippi State Bulldogs (HC: Dan Mullen, 8th season) – They must replace Dak Prescott, which is going to be difficult to do, but they have a pretty decent roster coming back around whoever is under center. They won’t be good enough to compete with the top teams in the division, but they can absolutely hold their own. 4. Mississippi Rebels (HC: Hugh Freeze, 5th season) – Controversy is still rolling around at Ole Miss, but Chad Kelly and a bunch of All-Conference players return, despite a trio of first round picks leaving for the NFL. They have the potential to still beat Alabama, but they will always be the bridesmaid in the division. 3. Arkansas Razorbacks (HC: Bret Bielema, 4th season) – The team is going to be stout on defense, and with a new starting quarterback, their outlook offensively is up in the air. Bielema is as uncompromising in playing within his own style as any coach, so I have to think that they will again be a tough out for any SEC squad. 2. Alabama Crimson Tide (HC: Nick Saban, 10th season) – Even though the schedule is completely manipulated to make it as easy as possible, they actually have a few really tough road games and a real threat in the non-conference with USC. I expect them to lose a couple games and miss the SEC Championship and (hopefully) the playoff. 1. 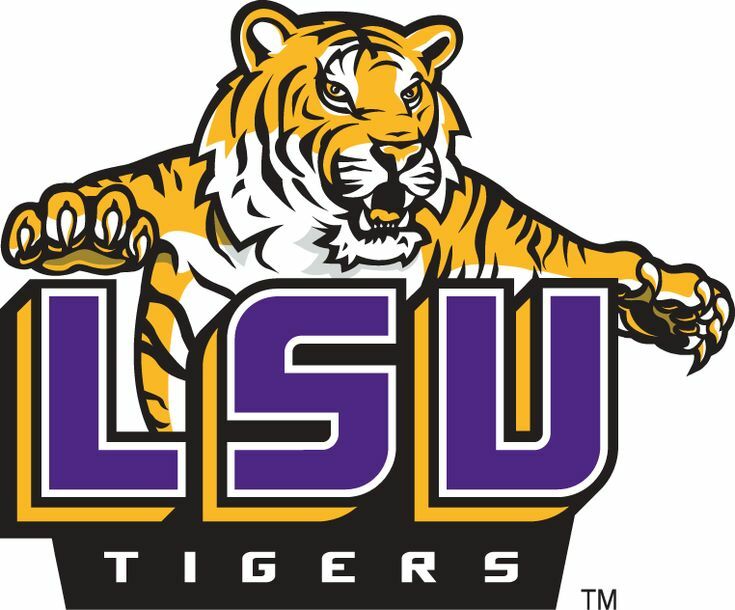 LSU Tigers (HC: Les Miles, 12th season) – You have to love the returning talent and potential of LSU this year. Leonard Fournette returns for his third and final year in college. They have a real returning quarterback and some options at receiver. New defensive coordinator Dave Aranda may cause a slight learning curve, but the only tough game in the first five weeks is Wisconsin, Aranda’s former employer. 6. Oregon State Beavers (HC: Gary Andersen, 2nd season) – Andersen is a great coach, but nothing could have helped the putrid roster that he had in 2015. He might be able to sneak a conference win this year with some returning players and a transfer QB, but this is the best division in college football. They have a long way to go before getting out of the cellar. 5. California Golden Bears (HC: Sony Dykes, 4th season) – Getting air raid veteran Davis Webb as a graduate transfer should stifle the impact of losing the #1 pick in the draft. The defense actually had some improvement, but they will need a lot more in order get this team competing for conference championships. 4. Oregon Ducks (HC: Mark Helfrich, 4th season) – The true colors of Helfrich were shown when Vernon Adams was not available for parts of last season. The offense is still pretty sustainable, and Brady Hoke could provide a spark to the defense, but this team seems to be on a downward trend. Royce Freeman can only do so much. 3. Stanford Cardinal (HC: David Shaw, 6th season) – Shaw is normally really good at reloading seamlessly, but Christian McCaffrey is really the only impact player returning to its offense. The defense lost its emotional leader in Blake Martinez. It will be Shaw’s toughest task yet. 2. Washington State Cougars (HC: Mike Leach, 5th season) – It would be easy to write off last season’s improvement as an aberration, but Luke Falk and Gabe Marks alone are enough to make this offense click as well as it did in 2015. They were the best road team in the conference last year. The Apple Cup could very well decide the division. 1. Washington Huskies (HC: Chris Petersen, 3rd season) – The reason for all of the hype around the Huskies is its returning talent at the skill positions, as well as how much growth their underclassmen showed throughout last year. There are potential All Americans all over the defense, as well as under center with Jake Browning. This should be the best team in the conference. 6. Arizona State Sun Devils (HC: Todd Graham, 5th season) – 2015 was a nightmare for a team with playoff expectations. They lose their whole line, their QB, and their playmaking RB from that team anyway. The defense was an issue as well. Graham might not survive if they finish in last in the South and miss a bowl game after last year’s disappointment. 5. Colorado Buffaloes (HC: Mike MacIntyre, 4th season) – There has been enough improvement shown that justifies taking them out of the cellar. The health of Sefo Liufau will be key to their early success, as well as a host of returning talent on defense. This could be the most complete Colorado team in a decade, which I realize isn’t saying a whole lot. 4. Arizona Wildcats (HC: Rich Rodriguez, 5th season) – Anu Soloman brings back some stability to an offense that should carry the team. Bringing in a new defensive coordinator should lighten the impact of losing Scooby Wright, among others. Rodriguez has the pieces in place to finally win a conference title, but it just won’t happen this year. 3. UCLA Bruins (HC: Jim Mora, 5th season) – Yes, they have Josh Rosen. Yes, they have expectations of a conference title. But yes, they are UCLA. Until they actually put all the pieces together, I am done predicting them to win this division. 2. USC Trojans (HC: Clay Helton, 1st season) – The Trojans have as much individual talent as any team in the country, but the uncertainty of Helton’s ability to bring it all together, as well as the lack of a clear #1 quarterback, will hold the team back for a bit. The opener against Alabama is a must-see. 1. 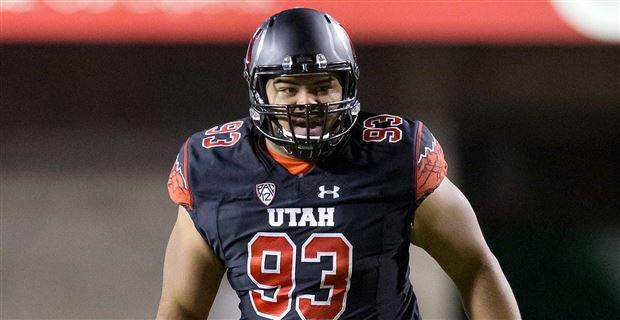 Utah Utes (HC: Kyle Whittingham, 12th season) – They may have to break in a new quarterback, but last year was an important season for the development of this program. If the players can continue to grow and realize that they really are as good as anyone else in the conference, then they can take their place atop the division. I believe that happens this year. 5. Cincinnati Bearcats – The Bearcats disappointed after having New Years Six expectations in 2015, but they return powerful QB Gunner Kiel, who along with his occasional replacements, led one of the most prolific offenses in the country. Tommy Tuberville takes over the playcalling on defense, so that could boast good results even early in the season. 4. Boise State Broncos – The Broncos took a slight step back after winning another Fiesta Bowl in 2014. They do, however return their starting quarterback and some NFL caliber defensive players. They’ll have a tough road early, but they will be clicking by midseason. 3. South Florida Bulls – The Bulls had a really good 2015 under new head coach Willie Taggart. They had a tough physicality and gave some top teams a pretty good game. They finished on a tear offensively, and I have to think that trend could only continue with the growth of the young squad. Their schedule is tough, but if they can get out with one or two losses, they will be right in the mix. 2. San Diego State Aztecs – The 2015 Mountain West champions return Donnel Pumphrey, one of the best running backs in the nation. They have a good chance to run the table if they can get past in-state foe California in September. They also miss Boise State on the crossover. 1. Houston Cougars – Tom Herman remained in Houston, giving them instant momentum to have a return to the New Years Six. Greg Ward Jr. is back under center, promising a dynamic offense that should coast through the AAC. They do get Oklahoma at home, which depending on the records of the major conferences, could be the ticket to vault them into the playoff. 5. Tennessee Volunteers – Tennessee has a bunch of returning starters from a formidable 2015 unit. Derek Barnett is potentially the best defensive player in the SEC. Bob Schoop was brought in from Penn State to coordinate the squad that will be strong at linebacker and have a vicious pass rush. 4. LSU Tigers – Bringing in Dave Aranda from Wisconsin should make an immediate difference for this team that regressed defensively in 2015. They have NFL players all over, but Aranda will make them a more disciplined defensive team. 3. Washington Huskies – They were one of the best in the nation last year, and despite losing a senior leader to the draft, they return virtually all of their important pieces, including the undisputed best secondary in the nation, led by Budda Baker. Pete Kwiatkowski has become a rockstar a D Coordinator. Combine that with the calm and genius of Chris Petersen, and this group should show no signs of slowing in 2016. 2. Michigan Wolverines – Michigan replaces coordinator DJ Durkin with Don Brown, the architect of the best statistical defense of 2015 at Boston College. Harbaugh’s team is littered with talent, especially Jabrill Peppers, one of the best all around players in college football. They will be incredibly tough to score on. 1. Alabama Crimson Tide – Jeremy Pruitt was brought over from Georgia to replace beloved Saban assistant Kirby Smart as the playcaller of the defense. They lost a lot of talent to the NFL as usual, but no one has more 5 star players waiting for an opportunity than Alabama. Tim Williams and Jonathan Allen will lead the way for the Tide to have the most effective defense in the country once again. 5. Florida State Seminoles – There is some uncertainty at quarterback, but any team that has Dalvin Cook running the ball is in good hands. They will be dynamic on offense if touted freshman QB Deondre Francois takes the QB spot, but they will still be balanced with Sean Maguire at the helm, forcing Cook to have a Heisman-winning season. The strength of the Seminoles offensive line can’t be overlooked either. 4. Notre Dame Fighting Irish – Whether DeShone Kizer or Malik Zaire are at quarterback, the Irish will return quite the offense. Yes, replacing Will Fuller, Ronnie Stanley, and CJ Prosise will be a handful, but the offensive line is in great shape. Tarean Folston should also prove to be the next great at running back for Notre Dame. 3. Oklahoma Sooners – Returning Baker Mayfield is huge for the Sooners. They also return both of their stud running backs Samaje Perine and Joe Mixon. The team was incredibly young last year, and they made an appearance in the college football playoff behind this unit. They should be every bit as good, even though senior leader Sterling Shepard is off to the NFL. 2. Baylor Bears – Scandal or not, Baylor is still absolutely loaded on offense. Art Briles may be gone, but his son Kendall Briles is not. Corey Coleman was tremendous, yes, but so were the last 5 NFL receivers coming from Baylor. KD Cannon is the next in line. Seth Russell was the best quarterback in the nation before his injury a year ago. Shock Linwood still somehow has eligibility. This team should once again be in the top 5 nationally in points and yards. 1. Clemson Tigers – DeShaun Watson is maybe the best player in the nation, and he returns for his junior year to lead what many believe is the most talented team in the country. Mike Williams comes back after an injury in week one, who is poised to be the best receiver in the ACC. Wayne Gallman returns as the running back, a player who was constantly cited last year as being the most underappreciated player on the team. The offense is incredibly deep. We will have to see if the defense can reload enough to make it matter. 5. Les Miles, LSU – A lot of picking candidates for Coach of the Year depends on in-season circumstances, but Miles is a strong contender. He has one of the most talented teams in the nation, and he had that bizarre deal after the season when he was all but fired, but then he was somehow brought back. If he wins the SEC, then the writers might throw a bone his way. 4. Butch Jones, Tennessee – If Tennessee lives up to the ridiculous expectations everyone is putting on their shoulders, then Butch Jones could be a clear choice for this award. He was touted as the next Brian Kelly after his stints following him to Central Michigan and Cincinnati, but this would finally be the validation of that claim. 3. Tom Herman, Houston – These awards go to smaller conference teams more than you would think. Herman has a tough road ahead of him, but he is one of the most respected coaches in the nation already, and he turned down some major jobs to stay loyal to Houston. You have to respect that, and if he can return to the major bowl games as the nation’s only unbeaten team, then this award could become a foregone conclusion. 2. Jim Harbaugh, Michigan – The Wolverines have such an easy schedule that they could run the table without a whole lot of trouble. If Harbaugh takes Michigan from where they were at two years ago to being ranked #1, then this award would be basically unanimous. 1. Chris Petersen, Washington – He has already won the award twice, but taking Washington to the playoff would make this an easy choice for the voters. He is already viewed as one of the best coaches and men in the business. This would prove without a shadow of a doubt that he is among the elite of his era. 5. Zach Banner, T, USC – 6’9” 360lb. Obviously, he is a mammoth human being and an absolute mauler for the Trojans. Many point to Cam Robinson as the top tackle in the draft, but as the process goes along, Banner will prove to be the class of the O-line prospects. 4. Desmond King, CB, Iowa – 5’11” 185lb. He is a playmaker and shutdown corner for the Hawkeyes. Players like King don’t come around every year. He won’t drop far in the draft, barring an unforeseen setback year. 3. 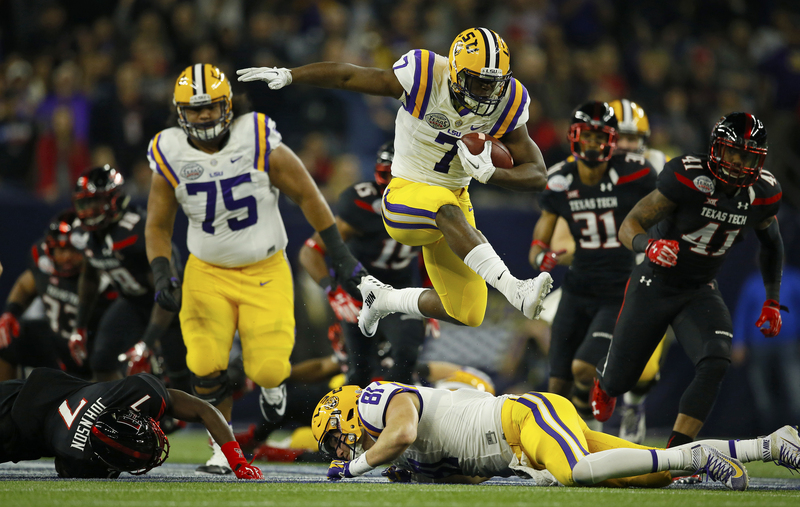 Leonard Fournette, RB, LSU – 6’1” 230lb. If he could have come out after last season, he would have. What is underrated about the big powerful running back is his speed. He is the perfect mix of size and burst. He could be the next Jamal Lewis. 2. 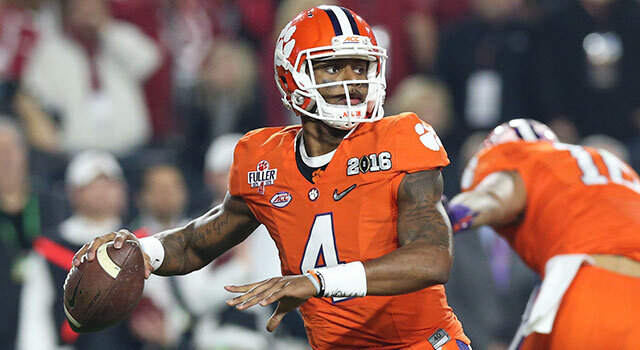 DeShaun Watson, QB, Clemson – 6’2” 210lb. He has the ideal size and leadership ability of an NFL quarterback. He is dynamic with his legs and accurate with his underrated arm. He sounds a lot like RGIII when he came out. 1. Myles Garrett, DE, Texas A&M – 6’5” 262lb. He is a monster on the defensive line. He is the best pure pass rusher I have seen in a long time, including Jadeveon Clowney. Unless he has a mediocre year with the rest of the Aggies or if the Browns are picking first, then he should be an obvious #1 pick. 10. 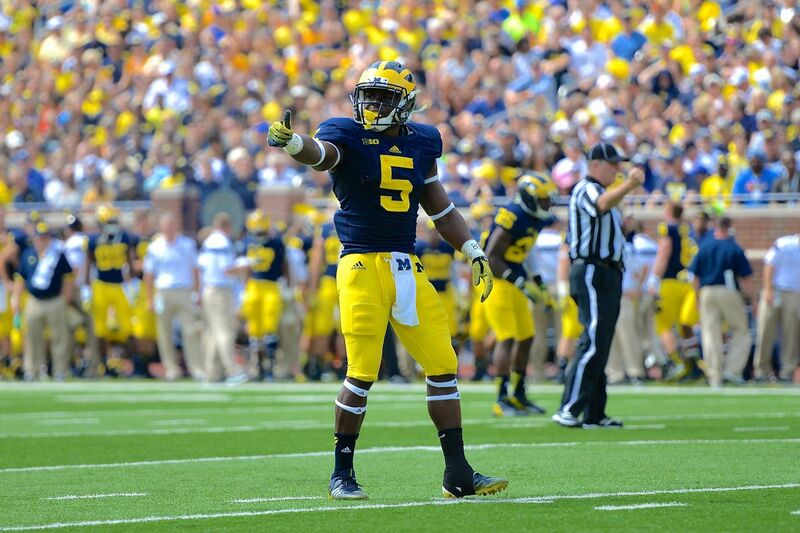 Jabrill Peppers, S, Michigan – He is the most versatile player in the nation. They are grooming him to be the next Charles Woodson. Last year, he had 50+ snaps on offense, was the best returner on the team, and he was the unquestioned best defensive player. If he can put all of the stats together, then he can certainly make a run at an invite. 9. DeShone Kizer / Malik Zaire, QB, Notre Dame – The offense is going to be impressive no matter what. Both players are absolutely capable of running it and putting up dynamite numbers. I tend to be more of a Zaire guy, but I really have no idea which quarterback Kelly will choose. 8. Josh Dobbs, QB, Tennessee – He is the leader of a team with incredible hype. He had a strong year in 2015, including a few games where his physicality and talent really jumped off the screen. A repeat performance and an SEC title could make this Dobbs’s award to lose. 7. Josh Rosen, QB, UCLA – The comparisons to Peyton Manning are still everywhere. UCLA will need to have a season where they don’t disappoint for once, but he can definitely lead them to where they want to go. He already looks like an NFL player out there. He is going to be a slam dunk #1 pick in the 2018 draft. 6. JT Barrett, QB, Ohio State – Two years ago, he played well enough to win the thing. Last year, he could not secure the starting job. This year’s team will have a much more balanced offense, and in the Urban Meyer system, the QB’s stats are unreal. 5. Dalvin Cook, RB, Florida State – He is the best pure running back in the country. If Florida State is as good as they should be this year, it will be because Cook carried them there. He very well might average over 30 carries. 4. Leonard Fournette, RB, LSU – They had basically inscribed his name on the trophy last season in September, but then he faltered a bit with the rest of his team. If he can stay focused and torch SEC opponents like he does the rest of the nation, then he might win that award he’s been posing for since his first touchdown as a freshman. 3. Baker Mayfield, QB, Oklahoma – The former two-time walk-on was right in the mix for the award in 2015. He needs to have an equal or better season in 2016 to unseat some of the other favorites, but he can do it. He is a furious leader, puts up quietly marvelous stats, and has a flair for the dramatic. Sometimes, that is enough. 2. DeShaun Watson, QB, Clemson – He is the quarterback of the team that everyone thinks is the favorite to win the CFP. He was invited as a sophomore last year, and this year one can only expect him to be as good or better with the best offensive personnel in the country. 1. Christian McCaffrey, RB, Stanford – He should have won the Heisman a year ago, breaking every all purpose record there is to break. He absolutely unloaded his frustration all over Iowa in the Rose Bowl to show his displeasure. He will come back hungry and better than ever. Barring injury, he should be the favorite most of the season. That concludes my preview. Who is your Heisman pick? Who do you see getting to the CFP? Let me know in the comments.